We all have films, that for some reason or another, we are embarrassed that we have not seen despite the critical acclaim they may have received. This is one of the reasons why I decided to create The Must See List series. Over at Toronto Screen Shots, James is attempting something similar, but on a far more manageable scale, with his Blind Spot series. The concept is to take 12 films you have not seen and ensure that you watch and review one each month. Ryan at The Matinee made the great suggestion of using the last Tuesday of every month as the day reviews will be posted. What twelve films are currently in your Blind Spot? I've seen nine of these, and like most of them. Black Narcissus is something special–I expected nothing from that film and found it truly captivating. My own 12 are:City Lights, Rope, From Here to Eternity, The 400 Blows, What Ever Happened to Baby Jane?, Bonnie and Clyde, Deliverance, Carrie, Thelma & Louise, Trainspotting, Magnolia, and The Pianist. 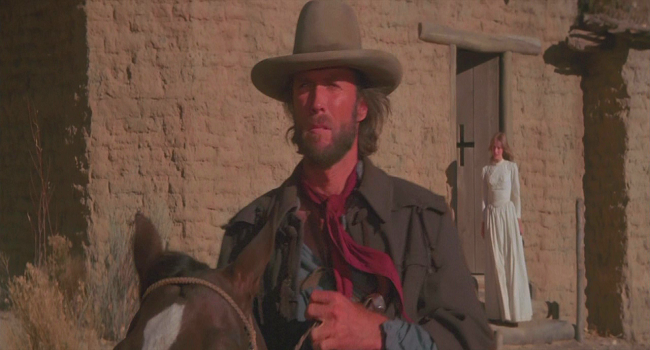 The two films in that list are Double Indemnity and The Outlaw Josey Wales.I never have a blind spot list because the list would be so damn long. I want to see more Godard, Truffaut, Fellini, Kurosawa, old Chaplin silent films, and a whole bunch of stuff. I'm going to see some Orson Welles films this year as well as some Merchant-Ivory and whatever comes across my path. It could be anything. That's one of the reasons I do these Auteurs piece was so it can give me a chance to explore a filmmaker I know and see what films I hadn't seen from them. @Steve – I have seen eight of the films on your list. I came really close to including City Lights on this list but opted for 12 Angry Men instead. City Lights is on my Must See List, as are the 12 films I picked for this Blind Spot series, so I will get to it eventually. @Steven – The Auteurs series that you do is great. It is a far more effective way of knocking iconic films off your to see list. I should really try and attempt something similar down the road. It's been a few years since Rashomon, but I remember liking it (there's a review somewhere in the Between the Seats archives), although my memories of Black Narcissus are still fresh. That is one heck of a piece of cinema, trust me. I've seen all of those but Vanishing Point, and you're in for some real treats. Double Indemnity is one of my absolute favorites, and Rashomon is the film that actually got me 'into' film. I think you've got a great year ahead of you! @edgar – I think I may start off with Black Narcissus considering all the positive things I have heard about it recently. @Mr Sheldrake – I am looking forward to both Double Indemnity and Rashomon, I have been procrastinating on both of those films for quite a while now. I've seen five of yours, and have Nashville on my list too. This is going to be fun! Some great choices CS. I've only seen 3 of those though, Badlands, Jesse James and Rashomon. Oh those are all really great movies – you're going to have a lot of fun watching/reviewing them.I went on a similar kick a few years ago of seeing all the popular, acclaimed films that I had been putting off. Now I mostly stick to obscure foreign flicks. I'd love to spend this year seeing the entire work of Buñuel, and a few others. @James – Nashville has been on my list for a while. Looking forward to knocking it off the list. @Castor – I really need to experience Malick's previous films. I started with The Thin Red Line. @Alex – Eventually, I hope to tackle specific directors (e.g. Godard,Bergman, etc). Of the movies on your list that I have seen (half), 12 Angry Men is definitely the best of the bunch. That's not because the others are bad, but because this one is so good. City Lights is a terrific movie, too, but you made the right choice between them by going with 12 Angry Men.I thought about joining this a few weeks ago, but four movies I would have put on it were the last four Best Picture winners I hadn't seen, and the more I thought about it, I couldn't see much reason to wait months to knock them off, so I watched three of them the week leading up to Christmas (Hamlet, How Green Was My Valley, and The Great Ziegfeld). I just have Cavalcade left. I'll have to watch it on my computer since it isn't available on DVD. @Chip Lary – There is still time to join, the films do not necessarily be acclaimed pictures. Just films you wanted to see but never got around to. It could be from any genre or any year. Some of my favorite are in here. Breathless, Badlands, Black Narcissus, 12 Angry Men, Rashomon.You're in for some good games. @Cinemasights – Just watched Black Narcissus this past weekend…still processing it but all I can say is "wow". I will elaborate more on January 31st.